Mittal Group and Bathinda Chemical’s Chairman Sh. Rajendra Mittal’s colonies constructed in 60 Acres land, was inaugurated by Chief Minister Mr. Prakash Singh Badal, accompanied with him where Mr. Sukhbir Singh Badal and his (Mr. Prakash Singh Badal ) wife Mrs. Surinder Kaur Badal. He was astonished when he entered the Ganapati Enclave, thinking whether he was in London or Bathinda. The infrastructures were designed in the way that it had its international features. He stated his desire to stay in the colony. He exclaimed that these types of colonies aren’t present anywhere. He did a thorough check of 24th house in that block and was satisfied, he told that this will change the living class of people. 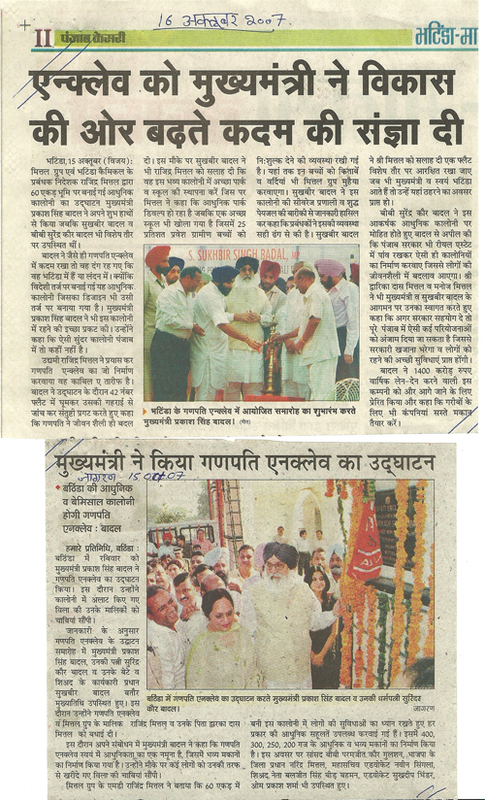 To this, Mr. Sukhbir Badal gave his opinion to Sh. Rajendra Mittal to have parks and schools in the colony, to this Sh. Rajendra Mittal mentioned that the parks are under construction and there will a school in which 25 special students from villages will get an education. They will be provided with books and uniforms. Mr. Sukhbir Badal had a thorough inspection of sewerage treatment and water treatment plant and was satisfied with the overall working of it. He told Sh. Rajendra Mittal to keep one of the plots well maintained so that whenever the CM visits he would have an opportunity to stay. Mrs. Surinder Kaur appealed to Badal that the existing government should take such initiatives to establish colonies with such facilities, to improve the living standard of the people. Sh. Dwarka Das Mittal and Mr. Manoj Mittal welcomed their suggestion and restated that if the government provides helping hands then they can carry forward such initiatives in the entire state.